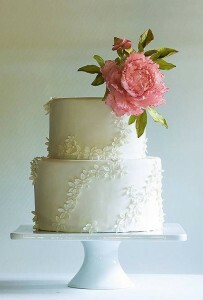 I love the delicate and romantic floral lace design on the cake. It was created with tiny sugar blossoms that were placed in a trail around the cake. The addition of just one pink bloom gives the cake the perfect pop of color! And you could always choose your favorite flower – personally I think daisies would look amazing on the cake, to tie in with the sugar flowers. You can find today’s beautiful cake here. It was created by Swedish cake designer Lina Verber Cake.